Explore Scotland's wild islands, home to some of the world's largest seabird colonies, including adorable puffins and noisy Arctic terns. The Scottish isles are a bird watcher's paradise with species such as fulmars, kittiwakes, guillemots, gannets and shags too. Your ship will get you as close to these sightings as possible, but you can also take to the water in Zodiacs and kayaks to really get the most out of your wildlife experiences. Seals will frolic close to you and you may encounter whales and dolphins swimming around you. 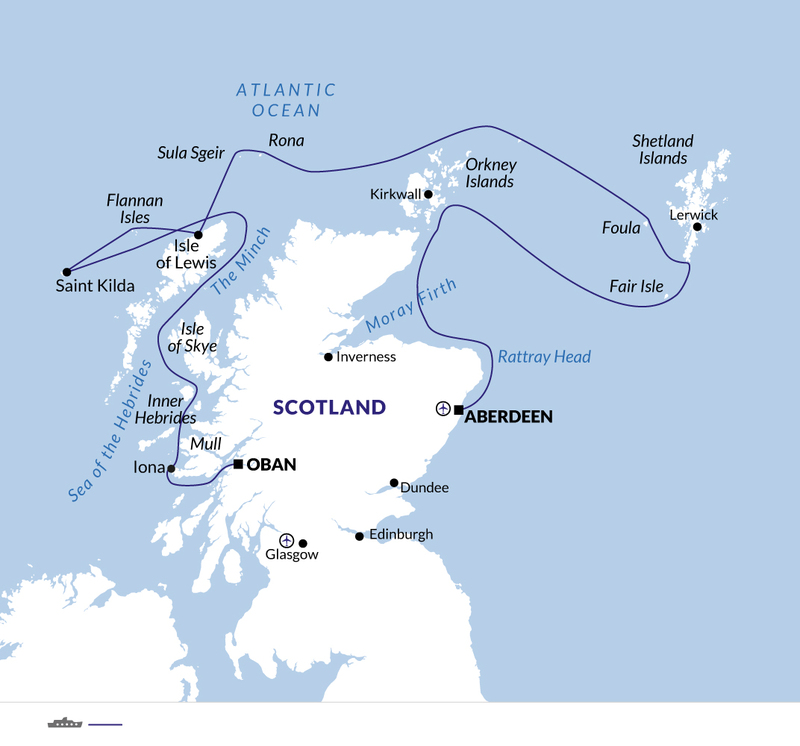 Back on land, discover ancient sites, huge monoliths and remote, picturesque villages in the Hebrides, Shetlands and little-visited tiny isles surrounding the mainland. This is a diverse exploration of rugged and remote Scottish islands, from a unique vantage point. Board the Polar Pioneer around mid-afternoon in Oban and, after settling in, set sail in the evening. From golden beaches to jagged peaks, bleak moors and heather clad hills, and from abandoned settlements to picturesque villages, your days in the Hebrides will be packed with variety. You'll explore remote lochs beneath some of Britain's most untamed mountains, wander between the bizarre rock formations of Skye's Quiraing, watch for whales, dolphins, otters and seals, or land at an island reserve that is home to red deer and white-tailed sea eagles. You may have the chance to sample single malt whisky at a distillery, or marvel at Fingal's Cave, where the melodious sound of waves crashing against towering basalt pillars inspired Mendelssohn's Hebridean Overture. The rugged island of Skye, named after the Norse word for cloud, is a hiker's paradise. It is a centre of Gaelic culture, and some islanders still speak the language. Hopefully, there will also be the time and right conditions to explore options on other, smaller islands to the west of Scotland, such as Barra, the Isle of Rum and Iona. It may also be possible to visit some fascinating spots along the coast of the Scottish mainland. Island hopping north and east, we aim to visit tiny specks of land that bear the brunt of ferocious Atlantic storms. If weather and seas permit, you will be able to explore Saint Kilda, a World Heritage Site, where derelict crofts bear testament to the fortitude of hardy islanders that once dried seabirds for winter food. On Lewis, there's the chance to visit Carloway Broch, and stroll among a mini Stonehenge at Callanais. Home to breeding seals and vast seabird colonies, Flannan, North Rona and Foula boast spectacular cliffs, fantastic rock stacks, hidden beaches and luxuriant heaths where sheep once grazed. Exposed to the full ferocity of Atlantic gales, the inhospitable volcanic stacks of Saint Kilda boast Britain's highest sea cliff (430 metres tall), and were once home to one of Britain's most remote communities. The settlement's last 36 residents were evacuated to the Scottish mainland in 1930, when the Scottish Office ceased to subsidise the community. The islanders had eaten seabird eggs, dried gannets and fulmars for winter food, and used their feathers, oil, bones and skins for fuel, tools and shoes. In favourable sea conditions it's possible to land on Hirta, the largest island (3.2 kilometres by 1.6 kilometres), to visit derelict crofts and the ancient chape. One of Europe's most significant seabird breeding colonies, with over 200,000 breeding pairs of all species, Saint Kilda is home to Britain's largest colonies of gannets, fulmars and puffins. It remains home to Soay sheep, perhaps brought here by Stone Age man over 5000 years ago. Britain's most northerly islands lie almost 160 kilometres north of the Scottish mainland, at a similar latitude to the southern tip of Greenland, or Bergen in Norway. Kept relatively warm by the Gulf Stream, Shetland's 100 islands experience almost 24 hours of daylight in summer. They abound with nature reserves and archaeological sites, and offer a taste of traditional island life. We plan to visit some of Shetland's best preserved and most complex archaeological sites of brochs, or fortified Iron Age towers, as well as some of the world's largest colonies of sea birds. Mid way between Orkney and Shetland, Fair Isle houses a major European ornithological research station, and is also famous for knitwear and historic shipwrecks. About 4.8 kilometres by 3.2 kilometres, it is surrounded by impressive cliffs. The 70 or so islanders mostly live in traditional crofts on the more fertile low-lying southern part of the island. A bird watcher's paradise, Fair Isle lies on the intersection of major flight-paths from Scandinavia, Iceland and Faroe. It attracts common species and also eastern rarities such as the lanceolated warbler. In summer, the cliffs teem with breeding fulmars, kittiwakes, guillemots, gannets, shags and puffins, and it is an excellent place to view seabirds at close range, especially puffins. The island also has over 250 species of flowering plants, including wetland flowers, rare orchids, alpine species and common wildflowers. You'll be welcomed by the hospitable villagers and may take a hike or visit the museum. Among Orkney's archipelago of 70 windswept islands, lying 9.6 kilometres north of the Scottish mainland, a rich tapestry of archaeology, history and wildlife awaits. You follow the passage of time - from 5000 year old World Heritage neolithic sites, past relics from wandering Vikings and reminders of World War II occupation, to present day crofting communities. Imposing sea cliffs teem with seabirds and cliff top paths and bleak moors beckon keen hikers. Upon arrival in Aberdeen, you will disembark the ship for onward travel. The UK has a temperate but very variable climate. In general the summers are warm with July and August being the warmest. The winters are cool and the lowest temperatures are recorded during January and February. Whatever the season it is advisable to be prepared for rain! Whilst landings are included in the cost of your trip as per the outline itinerary, some departures aboard the Polar Pioneer have additional optional excursions which can be pre-booked with the ship operator directly. These will be charged at an additional fee, depending on the excursion and we recommend booking these in advance, to ensure availability. Please speak to a member of our Polar team who will advise you on the booking process. A complimentary parka is provided for you on board the ship and is yours to keep after the voyage. It has a comfortable wind-resistant inner jacket, which is detachable from the waterproof outer shell, and is designed to be worn over your essential base layers. Carry a combination of UK Sterling cash, ATM and credit cards. ATM's are widely available in main towns. Can be exchanged at most banks and post offices. The M/V Polar Pioneer is a Finnish ex-research vessel, refurbished to provide an adventurous journey in the polar regions; its ice class means it has excellent manoeuvrability. The vessel accommodates only 54 passengers, meaning more time with the experts and a friendly on-board experience. Informed crew and experts will ensure you learn about how a polar expedition runs, your unique surroundings and the wildlife; Zodiacs will take you to shore for close encounters. Prices are based on the use of outward facing, category one cabins on the main deck. Category one cabins are based on triple share. They are comfortable, with two lower bunks and one upper bunk. The cabin has a desk, a small washbasin, a sofa and a porthole. Showers and toilets are close by and shared with other main deck cabins. The Polar Pioneer has a number of different cabin categories, all are outside facing and most cabins have two beds (suites have double beds.) Most cabins have en suite facilities and some have larger windows, rather than portholes. Single occupancy is an option on board, subject to availability. Call us for details on the cabin choice to fit your requirements. Onboard the expedition ship you'll find a diversity of international cuisine prepared and catered by professional chefs; all meals are included in the price of your expedition. Dining is casual in one of two dining rooms. There is always a selection of different meals available, and vegetarians will find plenty of options. Special dietary requirements can be accommodated with advance notice, please advise us at time of confirmation. Coffee, tea and water are all provided free of charge. All other beverages, alcoholic and non-alcoholic, are not included and can be purchased in the bar. United Kingdom: Visas are not required by Australian, New Zealand, US and Canadian citizens. Other nationalities should consult their local embassy or consular office. Nothing compulsory, we recommend protection against tetanus, diphtheria, polio and hepatitis A. The above is not an exhaustive list. Further information regarding vaccinations and travel health advice can be found by following the NHS and NaTHNaC links at http://www.explore.co.uk/Travelhealth/ and from your local healthcare provider. Visa and vaccination requirements are subject to change and should be confirmed before departure. Information Your expedition will disembark in Aberdeen on 2 July 2019 at approximately 09:00. The Polar Pioneer will normally dock at Regent Quay, which is a short walking distance from the city centre. Aberdeen airport is approximately a 10 minute taxi ride from the city centre. Passengers are advised not to book onward travel arrangements until after 12:00 on day of disembarkation.